Inshanae Smith competed in the NCISAA 1A/2A Track and Field Championships representing Victory Christian Center High School. Smith finished with the 3rd fastest Women’s 100m Dash Preliminary time crossing the line in a time of 12.26, she would finish 2nd in the final stopping the clock in 12.83. With a time of 26.41, Smith clocked the second fastest time in the Women’s 200m Dash Preliminaries, she would go a little faster in the final stopping the clock in a time of 26.27 to once again finish 2nd. Smith would clock a Personal Best time of 1:02.15 in the Preliminaries of the Women’s 400m race which was the second fastest, but in the final Smith would clock 1:07.16 to finish 8th. 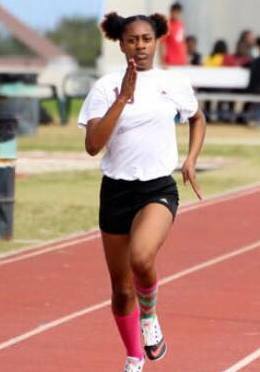 Smith would run the second leg for the Victory Christian Center High School Women’s 4x200m Relay team that clocked a winning time of 1:49.12.